Leave the house, take the lift, open the gate, walk on the sidepath, reach the train station, swipe your card, get into the train, reach my destination, swipe back your card, walk to my office, get into the lift and get into my chair. This is my morning commute every single weekday and takes place in the same order with almost nothing interrupting the routine. I might be blessed with a thrilling book to read while on the train. Some flowers may bloom in the spring to distract me with their fragrance on my walk. Or the most disruptive yet, there was some roadwork on the sidewalk that I had to skirt by. I would leave the house anytime between 9 am and 11 am depending on various circumstances in my ongoing life. If my husband wanted the car for the evening, I went on my scooter. If his bike was broken, I left the scooter for him and took the car. If I took the car, I would go late to avoid traffic. Various combinations of transport were available to us. The presence of my sister/brother/sis-in-law who were frequent visitors to our home also affected our commute plans. Getting back to my story… One fine summer morning, I dropped off my husband for some early calls to his workplace on my scooter. I still had some time before I had to be at work. 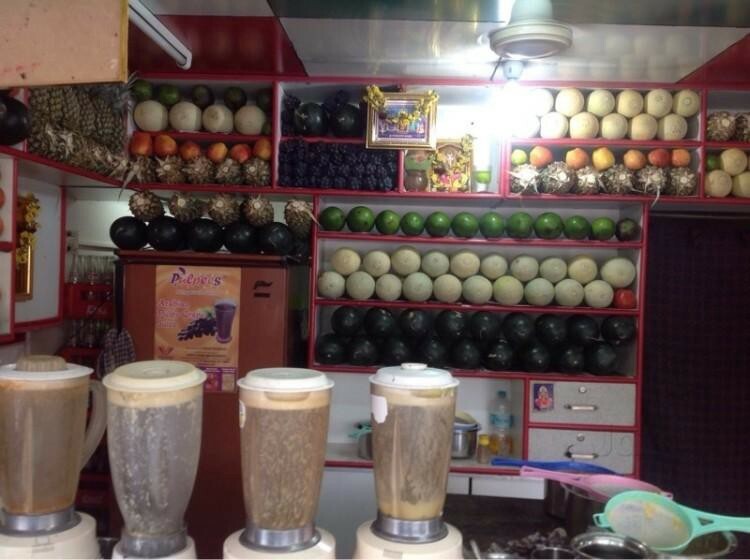 Taking advantage of this lull, I decided to drop in at the friendly local fresh juice shop (Bangalore is full of these). It was summer aka mango season. I ordered my favourite mango milkshake (without sugar) and proceeded to sit on one of the stools placed outside the shop for the short wait. Juice stores in Bangalore are, for some unbeknownst reason, named after a variation of the elephant god, Ganesha. Sree Gajanana Fruit Juice centre which was at the semi-main road a couple of roads down from my house is a typical fresh fruit vending shop. It displayed the day’s choice of fruit proudly through a glass window at the front of the shop. The pink wallpaper inside the establishment was punctuated by large shelves, which housed more fruit, a selection of water bottles and packaged juice. A refrigerator, a large table housing three mixers on one end and a plethora of glasses on the other end made up the small space. Two friendly men operated the store. One took the order and the other made up the juice. Little plastic stools were placed at the front of the shop which overlapped with the “sidewalk”. On the right side of the shop was the local grocer, on the left was our water vendor. It faced the largish road and on the other side was a junction with a small tree-lined road taking you to a residential locality. The street on the opposite was lined with affluent houses. As I sat on the stool watching passing traffic, an old man came by, ordered his juice and sat on the stool beside me. He politely nodded at me, said “Namskara” (a casual greeting) and then got immersed in his thoughts. Both of us had our eyes loosely on the junction on the other side of the road. As we watched, a truck came rambling from the perpendicular road to come join the main road. Residential areas were not the best suited for large trucks to go through, but what with traffic brimming the surrounding areas, this truck driver had decided to power through this narrow path and was almost at the end of his ordeal. As he reached the main road, BAM!, the top of his truck hit a low-lying branch of the tree at the corner of that junction. The old man and I were jogged out of our thoughts and looked at each other in surprise and amusement. One of the juice storekeepers came bouncing out of the shop with an expletive in tow. Maybe the truck driver was late for his appointment or even probably he was just too stupid to fathom the consequences. Instead of backing the truck into the road he came from, he furiously accelerated! The branch of the tree ground to the top of his truck and got firmly lodged in the gap between the face and carrier parts. The truck was stuck. The driver accelerated and it wouldn’t budge, he reversed and it wouldn’t budge. The old man and I both burst into laughter simultaneously at the enormous stupidity of the situation! The grocer, our juice storekeeper all rushed to the truck as the driver and his cohort sheepishly stepped out. Immediately a car lined up behind the truck and started honking to get the truck to move. Another car parked itself at the turning from the opposite side and promptly started honking too. A bike stealthily crept around the truck as a crowd slowly started gathering. As for me, I finished my yummy milkshake, waved goodbye to the old man and lept up my scooter to get to work through a different route.